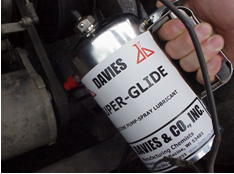 Davies “SUPER-GLIDE” is the pump-spray version of our highly successful “EASY-GLIDE” aerosol. “SUPER-GLIDE” is bulk packaged, meaning, Qt., Gal., 5 Gal. Pails, etc., and as such contains 100% product, no propellants, making this product highly economical. “SUPER-GLIDE” is sprayed directly on hinges, windows and door guides, fan belts, etc. ; almost anywhere that squeaks. Being a silicone, the lubricity remains on the hinge for an extended time. “SUPER-GLIDE” is ideal for automatic garage door openers drives, to prevent chattering during cold weather. “SUPER-GLIDE” lubricates weather stripping, auto door seals, window channels, emergency brakes, power windows, and carburetor linkage. Winter treatment prevents freezing of door locks, handles, and trunk lids. Many molding applications can use “SUPER-GLIDE” as an effective and low-cost mold release agent. For a most effective aerosol alternatives, Davies “SURE-SHOT” portable sprayers can be used.